Mochi is one of my favorite desserts and my kids especially love butter mochi. I decided to make some for Girls' Day. There are lots of different recipes out there with some calling for coconut milk. I decided to ask a friend for her tried and true recipe. As soon as I saw that the recipe called for 4 cups of milk, I decided to halve the recipe. 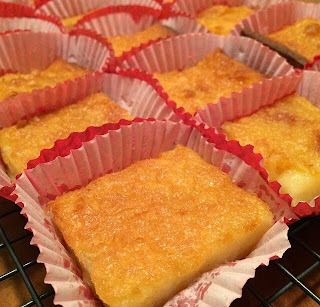 I still baked it in a 9x13 pan so the butter mochi was not as thick as it is supposed to be. But it still tasted delicious! Here is the unaltered recipe. Super simple. Mix 4 cups mochiko, 2 1/2 cups sugar, 3 tsp baking powder, 4 cups milk, 4 eggs, and 2 tsp vanilla. Melt 1 block of butter and add it to the mix. Bake in a greased 9x13 pan at 325 degrees for 90 minutes or until the edges are brown.